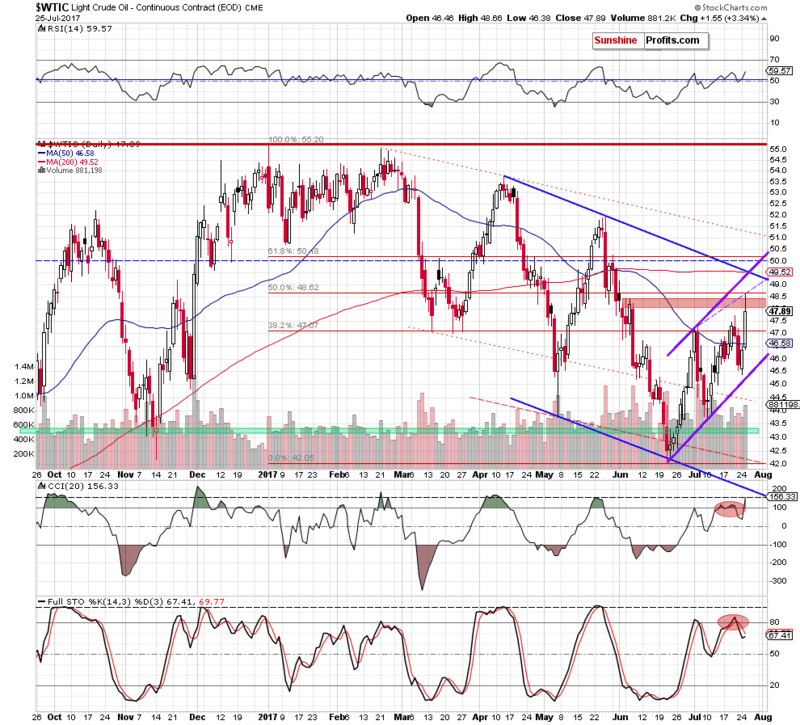 Will Crude Oil Extend Gains? On Tuesday, crude oil extended gains and hit a fresh July high, but will we see further rally in the coming days? 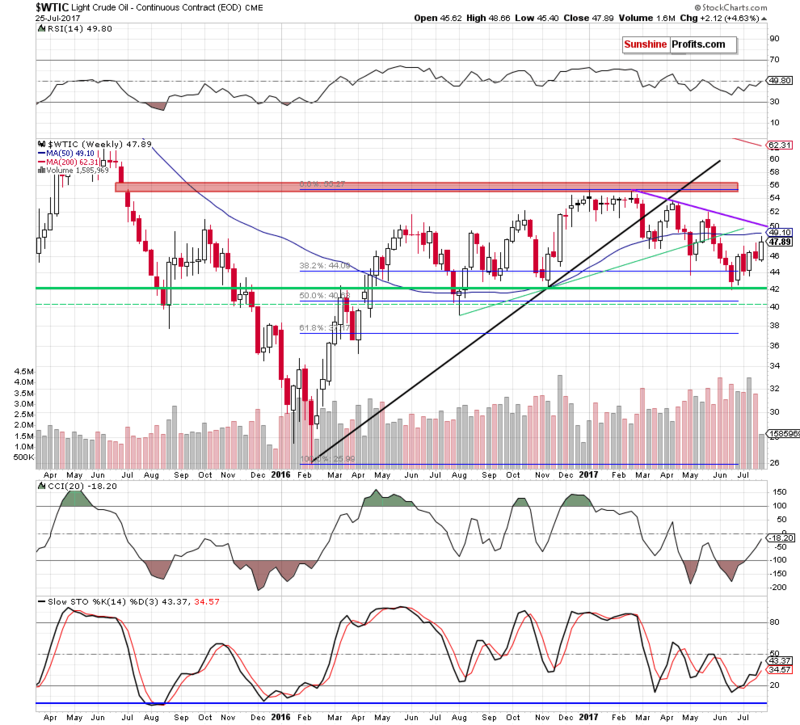 Looking at the weekly chart, we see that crude oil extended gains and approached the 50-week moving average. How did this price action affect the very short-term chart? Let's check. (...) Earlier today, oil bulls pushed crude oil futures higher, which suggests that the commodity will follow them in the coming hours. How high could light crude go? In our opinion, the initial upside target will be the last week high of $47.74. If this resistance is broken, we'll see a test of the red resistance zone marked on the daily chart. On the daily chart, we see that oil bulls pushed crude oil higher as we had expected. Thanks to yesterday's increase light crude not only climb to our upside target (the red resistance zone), but also tested the strength of the 50% Fibonacci retracement based on the entire 2017 downward move. Despite this improvement, this resistance encouraged oil bears to act, which resulted in a pullback and an invalidation of the earlier breakout above the red zone. What's next for the commodity? Taking into account yesterday's invalidation of the breakout and the current position of the daily indicators (the CCI increased to its highest level since May, while the sell signal generated by the Stochastic Oscillator remain in place), it seems that the commodity will extend losses in the coming days. Additionally the space for gains seems limited as the upper border of the purple rising trend channel, the upper border of the blue declining trend channel and the 50-week moving average are not far from yesterday's levels. Therefore, we think that even if light crude increases slightly later in the day, the combination of these resistances will be strong enough to stop oil bulls and trigger reversal and declines in the coming days. Finishing today's alert, please keep in mind that after yesterday's market's open the American Petroleum Institute showed that crude oil inventories fall sharply by 10.23 million barrels at the end of last week, but we didn't see a significant increase in the price of crude oil earlier today, which suggests that reversal may be just around the corner. Additionally, yesterday's data showed that gasoline supplies rose 1.9 million barrels, which doesn't bode well for further rally - especially if today's government data doesn't confirm such significant drop in crude oil inventories. In this case, oil bears will receive important reason to act and we'll consider opening short positions. If you enjoyed the above analysis and would like to receive free follow-ups, we encourage you to sign up for our daily newsletter - it's free and if you don't like it, you can unsubscribe with just 2 clicks. If you sign up today, you'll also get 7 days of free access to our premium daily Oil Trading Alerts as well as Gold & Silver Trading Alerts. Sign up now.